Laura Van Sant became a National Registered Medical Assistant in 1986. She joined Drs. Jaffe, O’Neill and Lindgren, now a division of Anne Arundel Dermatology, in 1995. 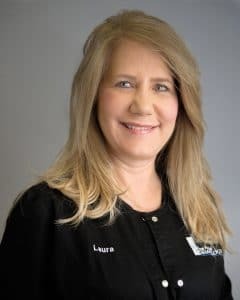 By 1999, Laura started doing cosmetic treatments for the practice, including Chemical Peels and Laser Hair Removal. Shortly after, she helped launch the Intense Pulse Light and Diamond Tipped Microdermabrasion. Most recently, she was promoted to Cosmetic Director of Derm Esthetics, the Cosmetic side of the Bethesda location. Laura is well versed in all cosmetic treatments and has unsurpassed knowledge of cosmeceuticals. She enjoys navigating patients through their cosmetic treatment journey to achieve and maintain a natural, yet more youthful appearance.